Brian Dillon is an Irish-born writer, critic and curator. His first book In the Dark Room was a startlingly fastidious childhood memoir, viewed through the prism of familial illness and grief and poignant reflection. He has continued to explore these themes through his study of Hypochondriacs (Nine Tormented Lives), his Ruins of the Twentieth Century project which has produced the novella Sanctuary, an anthology entitled Ruins and Ruin Lust, an exhibition at Tate Britain, which concentrates upon the notion of Ruins in art from the 17th century to the present day. Dillon is also an accomplished essayist, contributing to the London Review of Books, the Guardian and as the UK editor of Cabinet magazine. 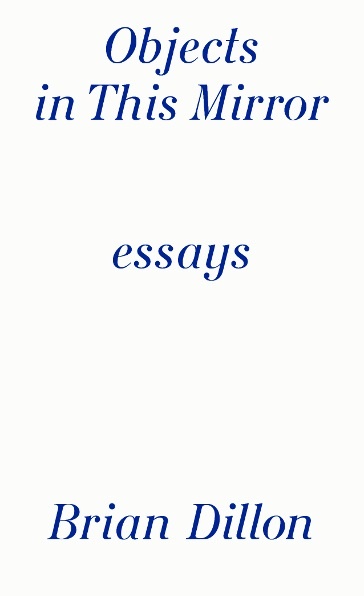 His first essay collection, Objects in the Mirror, is published by Sternberg Press and collates a selection of his writings on contemporary art, landscape, aesthetics and cultural history. The collection highlights both his obsession with obscurities and curios and his immensely lucid and rigorous prose style. Brian Dillon and Colm McAuliffe met at Tate Britain as Dillon prepared for the opening of the Ruin Lust exhibition in spring 2014. Colm McAuliffe: The figure of Roland Barthes is oft-cited as looming large as the definitively influential figure in your work, particularly in terms of In the Dark Room and now the essay collection Objects in This Mirror. However, I detect a stronger influence, that of the ‘new’ music journalism from the NME and Melody Maker newspapers of the mid-1980s. Brian Dillon: What do you think that is? Where is it? CMcA: It’s the straddling of the line between speaking about critical theory and being aware of an audience that isn’t necessarily overtly with such abstract concepts. BD: Not assuming [knowledge of critical theory], but therefore finding ways to talk about [critical theory], so that I’m not a straightforward academic? CMcA: Yes, if not seducing the reader within these strictures, then certainly thinking in this fashion. BD: Well, if that’s how it strikes you then that’…nice. I approve! I was born in 1969 and was twelve or thirteen when I started reading the NME, so I missed the era of Tony Parsons, Julie Burchill, Paul Morley, Ian Penman. Morley and Penman were still writing by the time I started reading although more or less on the way out. Morley was doing ZTT and Penman was about to be fired, apparently. But you’re dead right, those are absolutely the writers that made me think I would quite like to do that. That was the ambition when I was fifteen, sixteen: I want to write about music. And I never really did but those writers stuck with me as the model for how you should do this thing. When I then got to university, here was this amazing world of Barthes – whom I knew about as I started reading him in my mid-teens – along with everything that followed from that – Benjamin, Adorno – and, gradually, I kind of forgot about those [music journalists]. Because, I suppose, the pressure of what had seemed real excitement of theory was about texture in the writing and about, as you say, a sort of seduction. But it wasn’t beaten out of me at university, I had amazing teachers like Thomas Docherty, Seamus Deane and Declan Kiberd, and they had a personal style about them as well as a rigour and intellectual energy but in the longer run, there was a sort of flattening; you had to fit what you were writing to certain academic containers. And so, I started to think of those people like Morley and Penman – and now that I think of it, that ambition – as basically adolescent. That was what I wanted to be as a teenager. CMcA: So you discarded it. BD: Yeah, not just those writers and that style – and I mean, later I was reading the likes of Simon Reynolds, David Stubbs and Kodwo Eshun – but it was that juvenile ambition to be a writer, one can seduce as well as think hard. I talk about this in the ‘RB and Me: An Education’, about how all of that led you back to earlier – and a discovery of not just lineage of theory but also essayists who had a polemical, intellectual energy about them and also a certain style. And some of those NME writers [I viewed] alongside Clive James, Joan Didion, Normal Mailer, Susan Sontag. There was this whole other lineage of 1950s, 1960s writers. BD: It’s funny you mention him. My dad went to university and studied as a mature student. But it was only later I realised that my dad had read really early stuff by people like Terry Eagleton, when he was part of this strange Catholic left group Slant. So my dad’s bookshelves were littered with these brilliant books, there was a lot of T.S Eliot’s criticism who was his presiding figure, a surprising amount of psychoanalysis, and among all of this stuff was Connolly’s Enemies of Promise. By the time I was sixteen, I was obsessed with dandys, with Wilde and with the sort of generation or two after Wilde, people like Stephen Tennant and I think I might had read Bridesehead Revisited by that stage as well. And I realised that when Connolly writes about his schooldays and adolescent, going to prep school with Orwell and being at Eton, I realised he was on the fringes of that dandy scene which is why I read it. I discovered that he had this extraordinary style, he’s such an interesting figure, especially when it comes to his essay ‘The Unquiet Grave’. Have you read that? BD: It’s this book he wrote in 1944, an attempt to be like a mid-war, mid-twentieth century version of all his favourite French aphorists. So it has this urge or aspiration to be this cynical, weary, practical voice but it’s filled with these ridiculous moments where he admonishes himself for eating and drinking too much. Because he was vastly gluttonous and excessive and beating himself up because all his relationships were disastrous. I quite liked that combination of critical ambition with that sort of vulnerability. CMcA: Did you find a dearth of Irish-based practitioners of the essay form during this time? I mean, there were people like Sean O Faoláin and The Bell. BD: This is a terrible admission but when I was at college and looking around for writers to latch on to, there weren’t really any Irish writers other than Wilde, Joyce and Beckett. And that’s sort of a sin, you’re right, especially when you now consider periodicals and literary magazines. There was a whole other culture that I was too prejudiced to discover at that time but there was an aspiration there amongst people like O Faoláin. CMcA: In more recent times, the writings of Tim Robinson around his adapted Connemara home appear to bear most local resemblance to your own prose, the calibration of rigour and history and narrative. BD: I hadn’t even heard of Tim Robinson’s writings until about ten years ago when Brendan Barrington, my editor at Penguin Ireland and editor of the Dublin Review, had recommended him to me when I was writing In The Dark Room. He said to me that, ‘I can’t think of anybody in Ireland who might be doing what you’re aspiring to do but have a look at Tim Robinson’. And so I read Stones of Aran and it was just astonishing. Really, really astonishing. And puts all our efforts in the essayistic line to shame because he is amazing at the broad historical sweep, the anecdote and obviously the topographical aspect but also, at a level of sentence, of phrase, he is astonishing. So when I think of the pieces in Objects in This Mirror like The Dungeness essay [‘Lost Time Accidents’], they were written completely under the influence of Robinson. One of the things that really excited me at the time was that there was another person who really excited me in terms of moving through place. Obviously there was W.G. Sebald but Robinson was coming from somewhere completely different despite having so much of Sebald’s merits and also was lacking that Sebaldian melancholy which I was deeply attracted to, and still am, but Robinson displayed very different sort of sensibility. It seemed to be that something of the strangeness of his prose came out of his practice as a artist and the fact that when he writes about place, it’s much closer to Robert Smithson’s essays and has something of the wit of Smithson’s essays as well. And that seems to be quite far from Sebald but also from the notion of ‘The New Nature Writing’. It’s not that, it’s coming from somewhere much odder and richer and much more informed. So, yes, Robinson, definitely. CMcA: Of course, a figure like Sebald and his deeply melancholic essays and novels have become ubiquitous in the years since his death. Do you think there is a specific reason for the upsurge in this style of writing? BD: I remember having with a conversation with someone about ten years ago concerning the idea of the essay and using Sebald as an example of that, and wondering whether this was the form of the future, to put it in very crude terms. But it turns out that’s what has happened. And, of course, Sebald died thirteen years ago but in terms of what followed in many different fields, that kind of especially British nature writing of Robert Macfarlane but also many others, it seems like that sort of amphibious sensibility between fiction and essay has prevailed. It’s won! We won, at some level…which makes me a bit suspicious on one level. BD: Suspicious about the ease in which that is now accepted. I think I’ve done it in the past, to slip into the Sebaldian mode, the Sebaldian voice, especially the ‘journey’. And that seems like a very partial reading of Sebald but also it risks a very comforting romanticism especially amongst middle aged male writers! Which is something I’m a little bored with…I find myself looking for other models really. Looking for other models for the same thing, how you might make a – to use the publisher’s horrible phrase – ‘creative non-fiction’ that doesn’t have to use the wandering masculinist reflective view. These models press upon younger writers in interesting ways. Didion seems to be influential amongst my students but also more unusual people like Elizabeth Hardwick who wrote an amazing novel of sorts in the mid-1970s called Sleepless Nights and also has this amazing essay from 1976 on her friendship with Billie Holiday. feel there is a lineage there; I find myself reading lots of strange, short books by American women writers of the sixties and seventies…I’m not quite sure what that is but I’m sure there is another mode, there are other ways of being the creative non-fiction writer. CMcA: You mentioned the ‘wandering, masculinist’ view; many of the essays in Objects in This Mirror appear to adhere to this notion of textual perambulations. Can this be considered your own personal riposte to the strictures of academic writing? BD: It seems partly like a return to this idea I thought academia had promised in the first place which was not only that you can be an intellectual, a public intellectual, but that you could be a particular kind of writer with formal ambitions as well as intellectual, polemical and critical ambitions. It could be a way of inventing something new at the level of its structure, texture, voice and so on. I suppose, for better or worse, I imagined you could do that in quite short, quite mainstream forms of journalism because, as you say, the model for that had been there, not just in music writing of the 1980s but in film criticism of the 1960s and 1970s. So it was a way of rekindling the promise that the academy had handed out and then snatched away through endless tedium. CMcA: Your own academic background is in English literature but the primary focus of your work is more often within the art world. Does this give you a distinct advantage? BD: Sometimes I quote E.M. Cioran when he said ‘we’re enriched only by frequenting disciplines remote from our own.’ It’s a very attractive notion and yes, it’s probably true as I’ve been writing about contemporary art mostly, starting off with photography and broadening from that, for a little over ten years. So there’s an advantage in having a different frame, a different set of references to your colleagues and I suppose I admire that in other writers as well. It’s there in Barthes: he was not a linguist. He was a literary person, he had studied classics and wasn’t a structuralist himself and that idea that you can parasitize another discipline is quite a productive to be in, but it is also anxious as you’re never quite in control of your material. In terms of academia, the fact I never got an academic job [immediately after completing my PhD] was in some ways an accident. This was partly because I was so invested in the idea of theory that by the late 1990s, when English as a discipline has sort of devolved into historical periods above everything else, there wasn’t place for what I did. Also, I wasn’t a very good researcher. Sometimes I look back and say ‘I really should have written my PhD on Thomas de Quincy, or John Ruskin,’ somebody with several shelves worth of work. Then I would have had a topic! I wasn’t a very diligent researcher. But I think academia was quite right in not giving me a job, I was too much of a dilettante really. CMcA: Have you become more of a diligent researcher in the intervening years? BD: [laughing] It’s up to other people to decide! CMcA: The essays in Objects in This Mirror are divided thematically. But for a collection which is rooted in often more deviating concerns, is this nomenclature entirely necessary? BD: I hope the themes – which are to do with landscape, bodies, curiosities and writers – are a bit cursory, that was my intention, that it didn’t feel as if it was a coherent set of writings on a certain topic. Really, the idea of the book is that it’s a collection of stuff. And much of that stuff has little to do with the rest of the stuff. That’s what I quite like in books – there’s this thing that Geoff Dyer said years ago which was something like the only reason he writes novels was so that one day he could publish his collected journalism because he likes those sort of books. I like that kind of volume as well. CMcA: One of the theme titles is ‘On Land,’ a reference to one of Brian Eno’s ambient albums. Eno himself has the reputation as a quite a charlatan albeit one with a lucky streak! This made me wonder: is the essay form ideally suited to such chancers? BD: [laughing] There’s an essay on charlatans in the book! I quote Eno in that essay. Yes, I agree, partly because the essay allows you to adapt a voice and claim certain things for that voice, a localised expertise. But the odd thing about the classical essay is that its both localised but claims a universality. It is given to wild generalisation, claims an authority for itself even though it claims its own vulnerability. Those two things go together really easily. If you call yourself an essayist, you’re already allowing for the idea that you might be a charlatan, that you might be making it up, or re-making it up every time. CMcA: You’ve no qualms with this definition? BD: Not really, no. I hope that when I write my essays that I’ve done enough work to say something about the subject that is grounded in some reality. But I like the rhythm of finding out about a subject to the point where you are able to say something about it or to make a textual artefact that does something in that arena. And then you move on. There’s this line that Sontag said really early on [in her career] about her essays, about not wanting to be right but wanting it to have an effect and I quite like that idea; the essay is an affront or it might be, as you say, a seduction but it’s a gesture. CMcA: Where does it all lead to? Are you content in this realm of being an essayist? CMcA: A proper book! What does that mean? BD: [laughing] A big book! A big book about one thing. A book about an explosion in a gunpowder factory in Kent, near where I live, just after Easter 1916. The explosion killed over a hundred people and so it’s going to be about that event, its context in the war, and that landscape in Kent. Ultimately, there are diminishing returns from essay writing, in the way that there are if you just write book reviews or any critical writing. You have to vary your scale, really. Colm McAuliffe is an Irish critic and curator, based in London. He writes on music for The Quietus, film for Sight & Sound and Film 4 and have been published in a number of journals on periodical literature, specifically Sean O’Faoláin’s The Bell, and filmic adaptations of Ulysses.